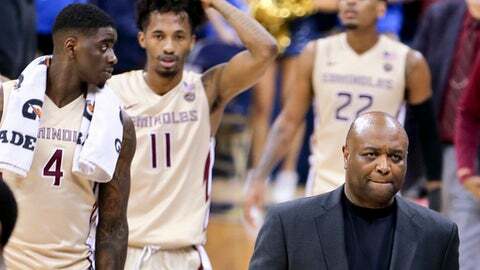 TALLAHASSEE, Fla. (AP) If Florida State wants to get one of the top four seeds in the Atlantic Coast Conference Tournament, the Seminoles must quickly cure their road woes. The 19th-ranked Seminoles play their next two games on the road, where they are 2-5 in league play and have dropped five of their last six. They play at Clemson on Saturday and at No. 10 Duke on Tuesday. Florida State (22-6) enters the weekend in a four-way tie for No. 21 Notre Dame, seventh-ranked Louisville and the Blue Devils. They each are 10-5 in the conference and two games behind No. 8 North Carolina, but the Seminoles are currently the second seed because of their 3-1 record over the other tied teams. The top four seeds earn a double-bye for the ACC Tournament, which begins on March 7 at the Barclay’s Center in Brooklyn. The Seminoles, who have trailed at halftime in every road game, opened ACC road play with a 60-58 victory at No. 18 Virginia on Dec. 31. All of the road losses have been by 12 points or more and they have trailed by 15 or more at some point. Florida State leads the conference in field goal percentage, shooting 49 percent. But on the road they have shot over 50 percent just once and are at 42.2 percent on the season. Hamilton liked what he saw in Monday’s 104-72 win over Boston College and hopes that performance can carry over to the next two games. He wants to see his team attack the paint more often in order to get open passes to the perimeter and more touches for his post players. He has also been stressing being more efficient in their half-court offense. Saturday’s game also should be a good test for FSU after it dominated Clemson by 48 points (109-61) on Feb. 5. The Tigers (14-13, 4-11) have their last three games at home and are trying to get a postseason berth. Senior forward Jarquez Smith said he expects that Clemson ”is going to come out with a grudge” and that the Seminoles have to play as relaxed as they do at home.